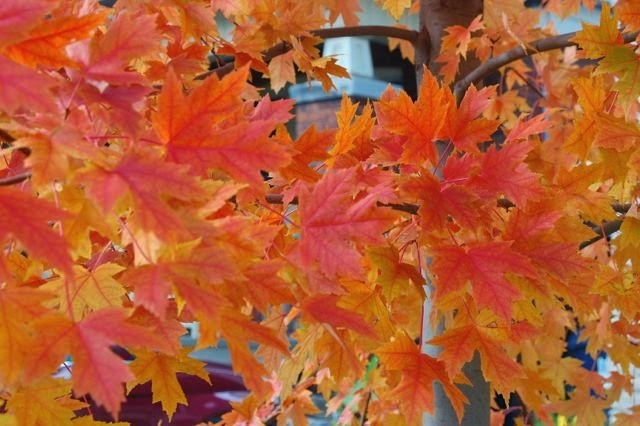 At this time of year, you can especially note how often Freeman or Freeman’s maple (Acer x freemanii) appears along our streets. That telltale “x” says this tree is a hybrid – a cross between red maple (Acer rubrum) and silver maple (Acer saccharinum) – and it’s typically described as having “the best characteristics of each parent.” It has the red fall foliage of red maple (without its distaste for urban pollution) and the fast-growing toughness of the silver (without its looming size). It’s appearing so often, in fact, that I’m a little worried that this splendid tree’s easy-going nature will turn it into the ‘Stella de Oro’ of trees – planted everywhere, and thus disdained by designers. As if the plant is to blame for the sins of the planter. But I do love the look of that long row of red sentinels, underscored by a long hedge of yellowing foliage. The silver undersides of the leaves gives a lightness to the crown. What I call a floaty feel. 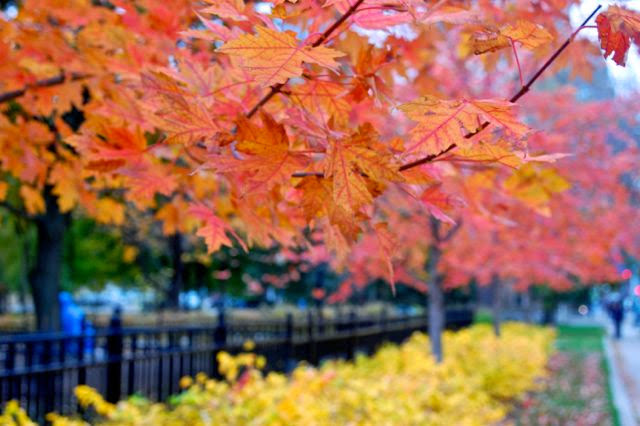 If you need a replacement tree for your front yard or boulevard strip, Freeman maples are on the list of street trees you can get from the City. They appear way to the right as a hybrid, but at least they’re a hybrid or two local natives. And how pretty they are! Click through for more complete information on this adaptable, and beautiful, tree from the University of Guelph arboretum and from Landscape Ontario. You can glimpse the smooth, light-grey bark of the young tree at the lower right. 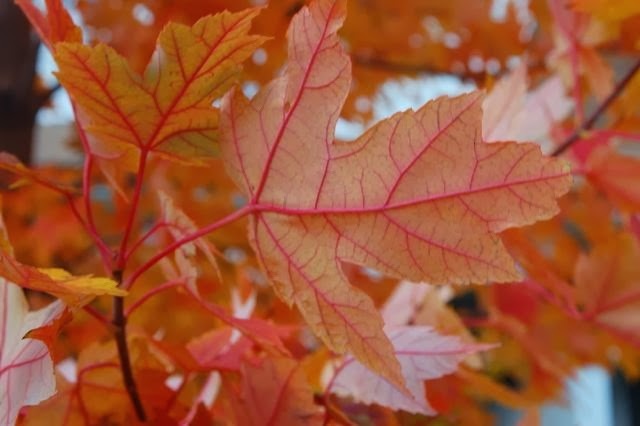 A leaf, in closeup, details the red coloration coming from the red maple parent. Note the red petiole or leaf stem. The deep sinuses (the inny bits) and silvery leaf undersides that come from the silver maple parent. thanks for sharing this tree profile, what a beauty. I was just reading about it from a program that Dr. Michael Dirr had spoken of 'Noble Trees'. Interestingly, in my app version of Dirr's woody plant manual, he actually classifies this as a red maple (Acer rubrum). Thanks so much for sharing this! 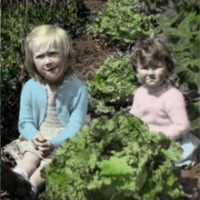 Would love to hear more from you. Summer foliage not so interesting, Esther, unless you count the silvery undersides on the deeply incised leaves. Nice when the wind blows.. But the leaves emerge pink/red in spring, so that's a plus. Some cultivars have better fall coloration than others. 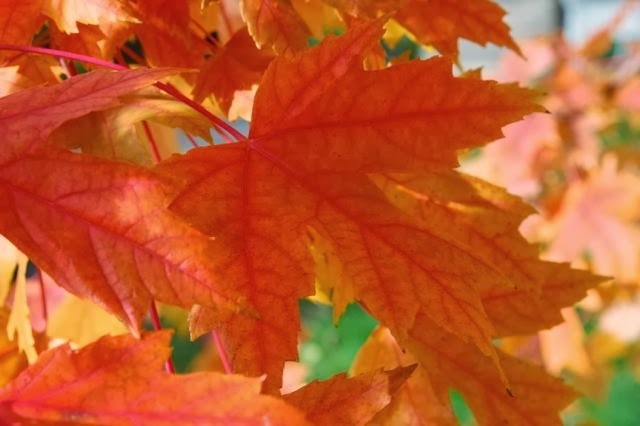 If fall colour matters, then it's good to visit the garden centre in the fall, although there can be down-sides (if the tree is container grown, it can be overgrown in the pot, for instance). But generally this is a good tree for fall colour, isn't it?